Antifragile is a term coined by Nicholas Nasseem Taleb to describe a business that benefits from the shocks of new technologies, also known as “Black Swans” – those unpredicted breakthroughs that cause CEOs to wake up in a cold sweat and investors to get cold feet. Black Swans and antifragility may soon become a hot topic in the world of graphene production, where competition is rapidly intensifying. 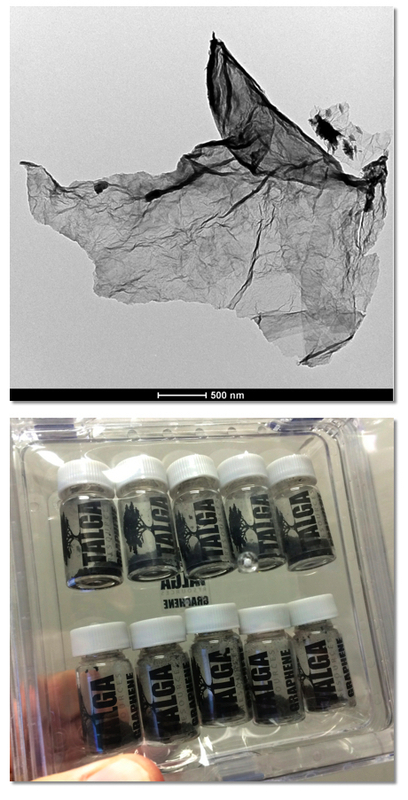 Talga – Digging Up Graphene? While most of the first wave of graphene producers are working on scaling up production and developing markets, there are big changes afoot, and a new wave of competition emerging. Many of the existing players have complex production techniques developed almost a decade ago, they have now been joined in the market by a group of Australian mining companies who have found a way to simply dig graphene out of the ground (almost). Their approach involves starting with some very high quality graphite, which is easy to exfoliate into graphene without the need for complicated processing. The best known example of this approach is Australia’s Talga Resources (ASX:TLG), who have just announced plans to produce between a hundred and two hundred tonnes of graphene a year in Germany. Their graphite can be mined in solid blocks and processed into graphene without the need for crushing and grinding, which provides major cost advantages. Digging graphene out of the ground may sound too good to be true, but another Australian company, MRL Resources (ASX:MRF), is working with a deposit in Sri Lanka, which it claims can also be used to produce graphene directly from the raw graphite. Unlike most pure play graphene producers, the Aussie miners are simply adding value to an existing asset, putting them in a less fragile position. If the market for graphene doesn’t reach expectations, they have a safety net in the global market for high quality graphite, a material that never seems to go out of fashion. Here comes the real graphene? Of course the real interest in graphene comes from the properties of the single layer material, rather than the graphene flakes produced by exfoliating graphite. As with any new material at this stage, there is little in the way of standard terminology, and materials supplied as “graphene” differ greatly – from true single layer material, to complete junk described as graphene on the premise that it contains layers of carbon atoms. The problem with the single layer material is that it is difficult to produce in volume, as it requires the costly chemical vapour deposition (CVD) process. While CVD works well for high value products such as semiconductors, it is less well suited for lower value applications, which gives the exfoliated graphite based materials the advantage in both price and volume, for now. This may change in the near future as continuous graphene production gets ever closer. This is a key component of the EU Graphene Flagship, with Spain’s Graphenea making solid progress in scaling up production. Researchers at MIT and the University of Michigan now claim to have cracked the problem of large scale production with a roll to roll process. Oak Ridge National Laboratory, who have their own roll-to-roll process, have perhaps gone a step further, fabricating composites by CVD. Meanwhile UK companies 2D-Tech and Cambridge Nanosystems have recently announced plans to scale up new graphene production methods. The Black Swans seem to be multiplying. Antifragility, just for miners and entrepreneurs? Production techniques are advancing quickly, promising dramatic improvements in both cost and quality. Graphene producers locked into propriety production technologies will have to watch their backs. Anyone with a cash pile (or access to one) should be looking to lock in customers quickly, or acquire new technologies to fight off the rising tide of competition. Everybody else needs to keep a sharp lookout for Black Swans.